The Fujitsu Digitizer Pen T-5000 features two buttons, an eraser tip and eyelet. It ships with five additional hard plastic nibs and an extractor ring. Lately it seems like another Surface Pro replacement pen option turns up for me to test at least once a week. I thought I'd exhausted all the compatible stylus options until a poster on the TabletPCReview forums suggested I check out the Fujitsu Digitizer Pen T-5000. Designed for the Wacom-equipped Fujitsu Lifebook series, it's not clear whether the T-5000 is widely available. The links on Amazon are all for third party vendors and the Fujitsu site doesn't reference the T-5000 directly. They list three Lifebook models with pen input, but the replacement pen sets listed as accessories don't have a model number. It's likely these pens are compatible with the Surface Pro as well, but proceed with caution unless you find someone who can verify this. The Fujitsu pen (center) is the same length as the Wacom Bamboo Feel Carbon above it, but that pen's cap makes it significantly longer. The Modbook Pro pen (top) is the only other two button replacement option I've tested, but the T-5000 is priced closer to the generic single button Wacom Penabled Tablet PC eraser pen (bottom). At first glance, the Fujitsu Digitizer Pen appears to be the smallest replacement pen we've reviewed yet. At 5.2 inches long, it's a full .3 inches shorter than the Surface Pro pen. However, it turns out the pen is actually the same length as the premium Wacom Bamboo feel pens. What makes those pens seem longer in practice are their large caps, which the Fujitsu lacks. But the T-5000's solid construction and textured finish almost compensate for that. The barrel is about the same diameter, so the pen doesn't really feel small in the hand. More importantly, the pen features an eraser tip and two buttons: a rarity in the world of replacement stylii. Although there's no way to store it or attach it to the Surface Pro, the pen has an eyelet located just under the eraser for attaching to a lanyard. The Digitizer Pen ships with a generous five replacement hard plastic nibs and an extractor ring. Like most tablet pc pens, the performance of the T-5000 is fairly equivalent to the standard Surface Pro stylus. Whenever you get a new pen you may wish to rerun the Wacom feel calibration tool to be absolutely accurate, but I didn't have any problem drawing without re-calibrating. The button rocker height is a bit closer to the pen barrel than I prefer, but the buttons are very firm and unlikely to be clicked accidentally. And despite the pen's short length, the button is located .1 inches further from the tip than the Modbook Pro pen (the other two button replacement option). This small difference makes it easier for fingertips to steer clear of the buttons while gripping the pen close to the tip. Compared to other lower cost pen replacements, the build quality of the T-5000 is excellent. If you're in the market for a two-button option, have smaller hands or don't mind a shorter instrument, the Fujitsu Digitizer Pen T-5000 is definitely worth a look (if you can find it). If any of you can confirm the model number and compatibility of the pens available directly from Fujitsu, please leave a comment below. The button placement of the T-5000 allows your fingers to steer clear if you hold the pen close to the tip. The .1 inch difference in the Modbook Pro pen's button placement makes it far more likely you'll tap the buttons accidentally. Purchasing items from the links below directly supports the maintenance of this site. UPDATE October 3: ArtRage 4 was one of the very first graphics apps we purchased specifically for the Surface Pro. And it still holds up as one of the best and least expensive tablet graphics tools available for Windows. Nearly a year ago, ArtRage user Stephen Berry decided to make the program even friendlier for tablet users by releasing the Pen-Only Toolbar. Now Berry is back with the official 1.0 release, along with a helpful YouTube video describing the improvements since the last release in March. This video provides a guide and demo for the newest version of the Artrage Pen-Only Toolbar. This toolbar is offered for free and can run in conjunction with Artrage to give you a host of really quick, dedicated buttons on screen. Installation is still a little tricky: it involves running a tool called Auto Hotkey and using it to install the toolbar. 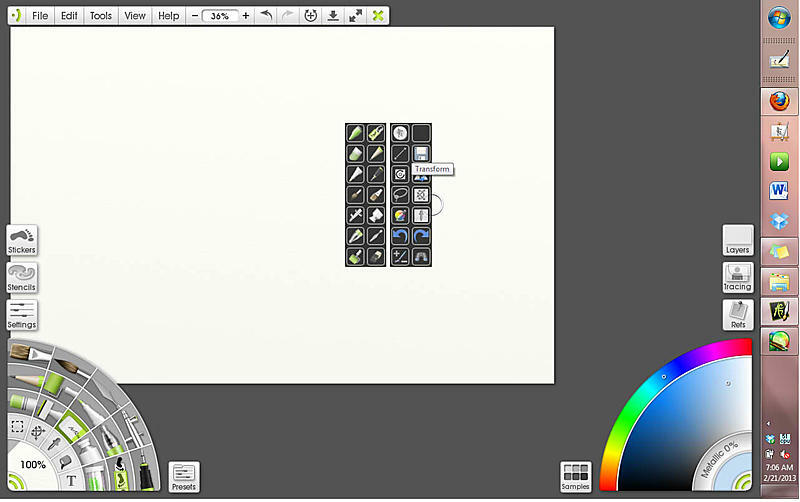 The ArtRage Pen-Only Toolbar download, located here, includes Auto Hotkey and a PDF with installation instructions. Give it a try and let us know if you think it enhances ArtRage's usefulness on the Surface Pro. Below is our original post from March 11. While you're waiting for your bluetooth keyboard to arrive (see the previous Must-have Accessories post), an intrepid ArtRage user has developed a tool that eliminates the need for a keyboard while using that application. We haven't installed it yet but it looks like an elegant solution to a major issue facing anyone trying to use a desktop paint application on the Surface Pro with its keyboard detached. For more information, follow the ArtRage community link here. UPDATE: This was one of our earliest posts, but the content still applies so we thought we'd move it up for the benefit of our newer readers. We would just add a low-cost external DVD drive and replacement stylus to the list of must-have accessories. Besides 20-20 eyesight to be able to read the teeny text and icons in Photoshop or 3DS Max, there are a couple of must-haves that you'll definitely want in order to make the creative experience on your tablet as productive as possible. Whether you bought the 64- or 128-GB Surface Pro, you'll soon be bumping up against a sad fact: graphics programs are huge. Minus any sample files or content, Windows 8 and the programs I've installed thus far (see What Runs and What Doesn't post for the list) are eating up 60 GB of storage space. With its handy USB port, you can attach an external drive or flash drive to the Surface Pro, but having devices hung off of the tablet is rather awkward and potentially hazardous to your data. Therefore, your first must-have peripheral is a capacious microSDXC card on which to store your creations. 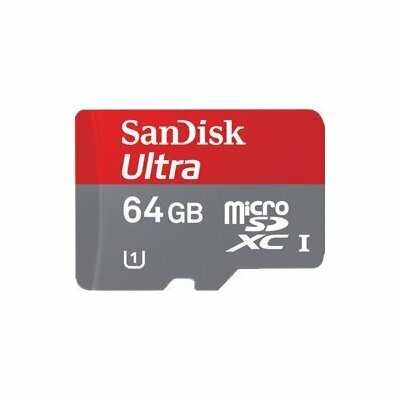 MicroSDXC is the latest generation of the SD family of memory cards. They feature extended storage capacity of over 32GB up to 2 TB. 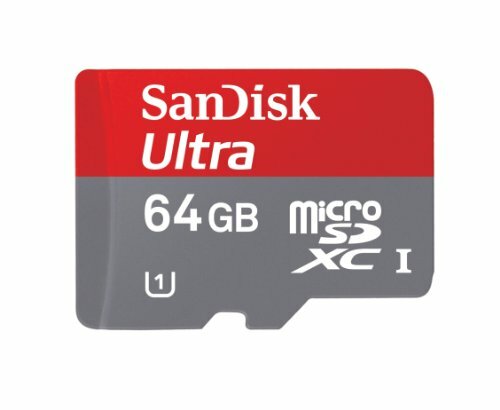 The SanDisk Ultra 64 GB card is available at Amazon for just under $60. For more information on the care and use of a MicroSDXC, check out the SD Association's write-up. The second must-have may not be so obvious when your first start using your Surface Pro or if you stick to Windows 8 Modern style apps. But if you want to do any serious work in desktop mode, you'll be howling for this peripheral right away. In its infinite wisdom, Microsoft decided to ship both RT and Pro tablets without a keyboard cover, even though it could be argued that this is its single-most distinguishing feature. If you use your Surface Pro as a laptop with the keyboard cover attached, you may never notice the problem, although you will face a challenge using the pen for more than doodling. Using the tablet as a sketchbook requires detaching the keyboard, but in desktop mode, Windows 8 doesn't automatically pop up a screen equivalent when you need it. You need to go down to your notifications to have the keyboard pop up and when it does it obscures half of your work area. Of the graphics tools available to date, only Sketchbook Pro and ArtRage 4 offer pen-friendly interfaces that require minimal use of pull-down menus and keyboard input. For everything else I've tried, not having a keyboard available has been an absolute productivity killer. Fortunately, the solution is simple and you may already own one. By pairing a wireless Bluetooth keyboard to your Surface Pro, you can cradle your tablet to your heart's content and keep your keyboard shortcuts easily within reach. I have the Logitech Ultrathin Keyboard Cover for iPad and it works perfectly with the Surface Pro. It took a bit of effort to get the tablet's bluetooth chip into pairing mode, but once I did, there have been no further hiccups. 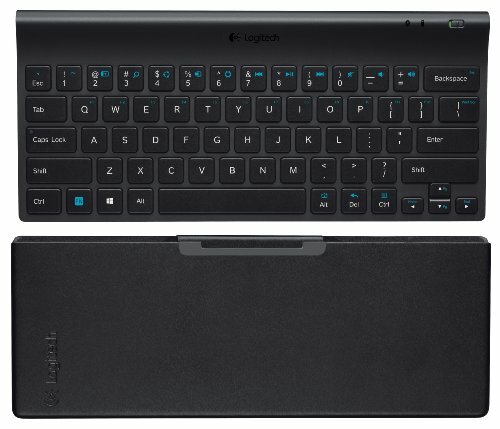 For $30 less, Logitech sells the Tablet Keyboard for Win8/RT and Android. Neither device replaces the Surface's cover, but for as low as half the price, you'll be able to throw in a padded sleeve to protect your screen. Don't know if this is a permanent price reduction or not, but Microsoft has just reduced the price of the Surface Pro by $100. Check out the Microsoft Store link here. This certainly makes our favorite Windows tablet more affordable for those of you sitting on the fence; although the drop in price may also signal that a hardware refresh is imminent. Caveat emptor! Microsoft just released its first system update for the Surface Pro. Unfortunately, the much-needed pen driver fix for pressure sensitivity in Adobe Photoshop is not included in this release. Fixes to Wi-Fi reliability allowing for better roaming and improvements to "Limited" connectivity scenarios. Windows To Go feature is enabled. Improved onscreen keyboard detection synchronization when going in and out of sleep. The Windows to Go feature allows users to run a Windows 8 Enterprise image off of a flash drive. Learn more about the feature here. To install your March update, go to Settings, Change PC Settings, Windows Update. Assuming you haven't changed the defaults, the update should already be downloaded and awaiting a restart. It's difficult to argue with this clear-eyed assessment of the Surface Pro as a creative tool from Artefact reviewer Olen Ronning. Like him, I think that the device should be dramatically better given six months and meaningful third party development support. Given the slow rate of quality apps showing up in the Windows 8 store, though, the latter is not a guarantee. This blog is for iPad artists too! You may recall the kerfuffle when Oprah Winfrey tweeted that the Surface RT was one of her "favorite things"...from an iPad. Pretty embarrassing (and I hope Microsoft got its promotional dollars back). So it was with some trepidation that I decided to write this post using the iOS Squarespace app. Yes, the creation of this blog has been 100% Windows so far, but that doesn't mean I won't need to write something on the run in the future. And most importantly, we're fairly OS agnostic here. We'll use anything so long as it gets the job done. We fully intend to do head to head comparisons between the Surface Pro, iPad, Nexus 7 and any other device that might fit in a professional or hobbyist artist's toolkit. And to prove it, here's an oldie but goodie speed painting video from iPad artist David Jon Kassan, who works miracles with his finger tips. We're not worthy. 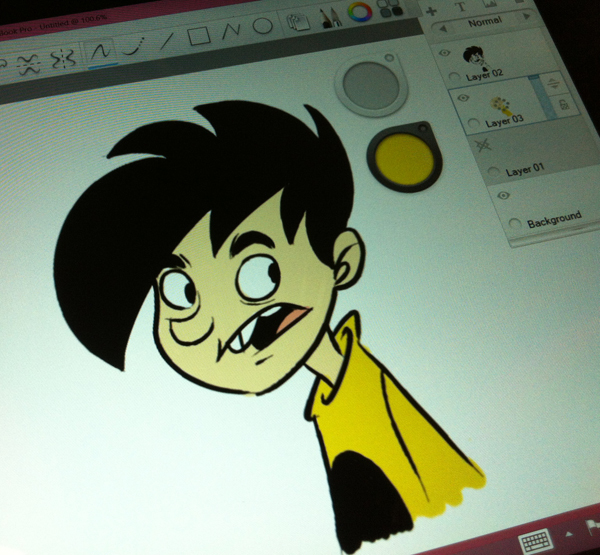 Penny Arcade web comic artist Mike Krahulik (Gabe, @CWGabriel) recently got a chance to take the Surface Pro for a test drive and wrote this exhaustive post about his experiences. It's a great read and filled with useful nuggets for artists hoping to produce professional quality results with their new tablet. Check it out here. He also posted a YouTube clip demonstrating his inking with Sketchbook Pro. The artist's write-up is so good that it prompted Apple defender John Gruber at Daring Fireball to write the following: "How ironic would it be if the iPad becomes the dominant mass market computer and the Surface becomes the one for artists?"